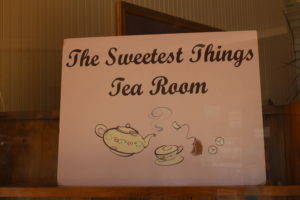 It may not be easy to find The Sweetest Things Tea Room but it’s worth it. Ignore what your GPS says. Ignore what their Facebook page says. They moved at the end of 2016 and the internet doesn’t seem to know it just yet and two of the three of us ended up at their old location. To help you get to the right place I’ll spend a little extra time showing you where it is. 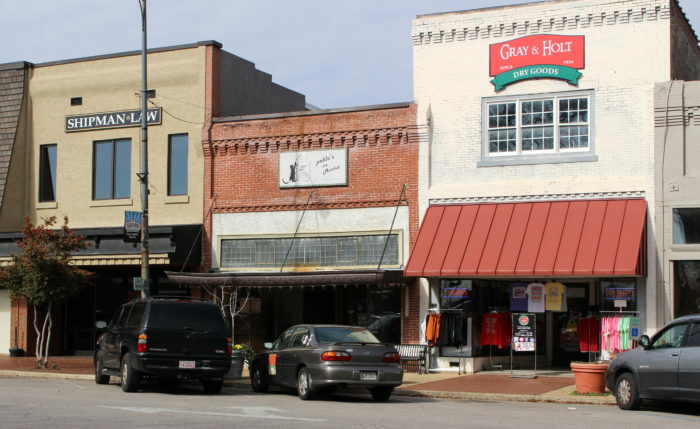 Plus, you get some glimpses of the quaint, yet thriving small-town of Athens, Alabama. Did you know that Athens is the hometown of the Alabama Shakes? How cool is that? Something else important to know: the town holds the “Athens Grease Festival” each year! I want to go to this wacky celebration of fried foods and maybe even wear a toga too! It sounds like a blast. But I digress. Back to finding the place. 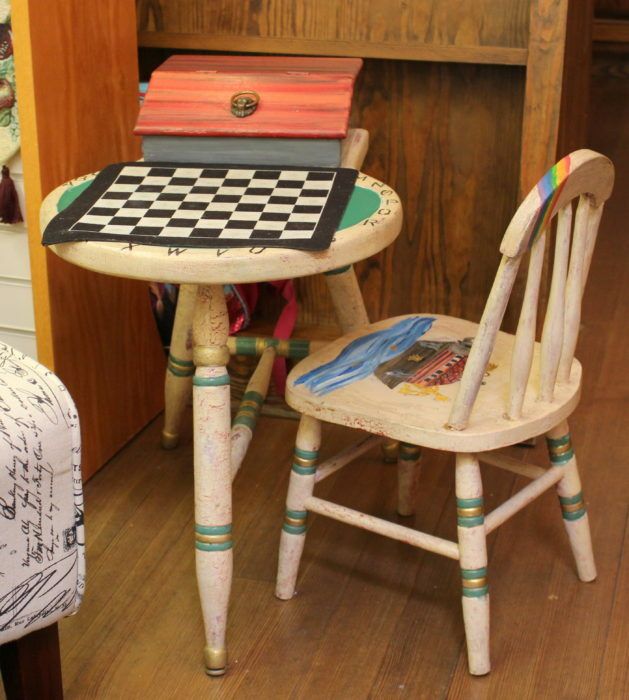 The Sweetest Things is on the North side of the square in Athens. Here’s what you’re looking for. It’s in the middle building. 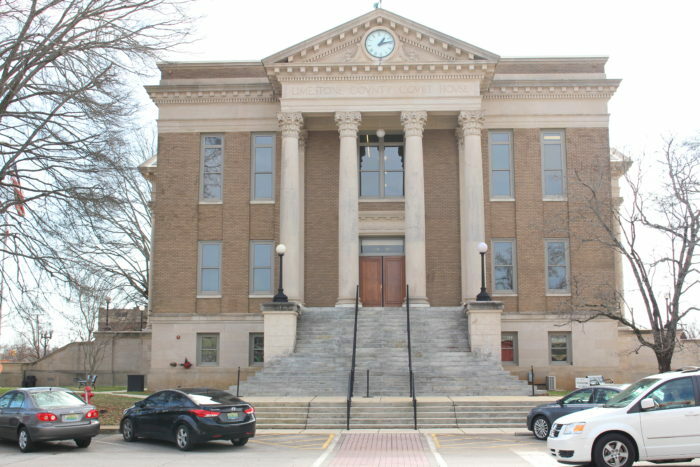 It’s directly across from this traditional county courthouse with its totally appropriate Greek-inspired architecture. Don’t you think it’s just like the courthouse in “Back to The Future?” I mean, come on, there’s a clock and everything! There isn’t any real signage for the restaurant except for this little placard in the window. I’d have to guess that they’ll get outdoor signage soon. In the meantime look for this. Here’s their front door. Apparently this used to be a book store because you see the phrase, “Art * Books * Coffee’ still stenciled on the window. Once inside you automatically relax and enjoy a little slower pace so natural to a small Southern town. 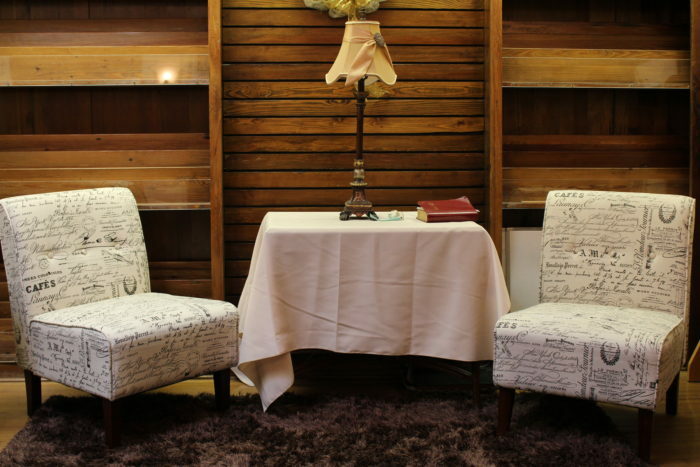 The restaurant is charming overall but these pleasant little nooks were quite inviting. I can see myself popping in with a book and settling in with a pot of tea or sitting down with a best friend and talking all afternoon. They even have a spot just for the little ones! 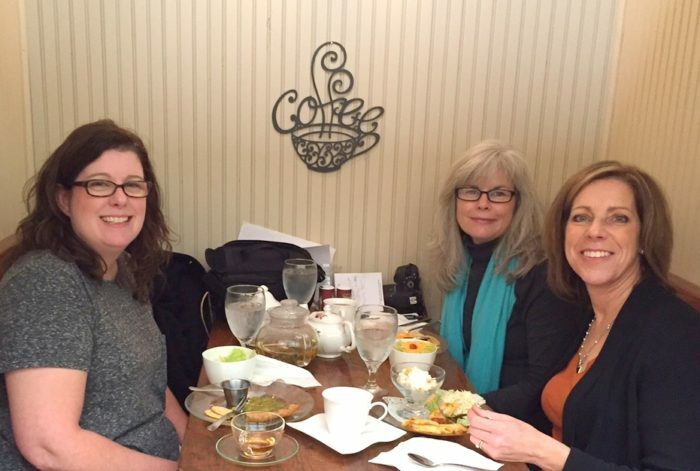 My fabulous friends and I chatted our lunchtime away in our cozy booth tucked away in a little private alcove. We were eager to try it out because we had been hearing good things about The Sweetest Things! 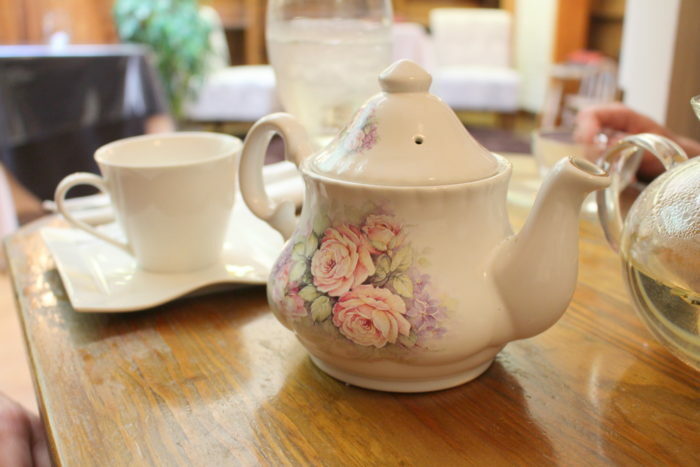 First came the teas in these pretty teapots. I had the Creme Brulee. It was a tasty strong black brew with a definite dessert flavor a little reminiscent of butterscotch. We also tried the Caribbean Breeze Tea but any flavors other than tea were hard to detect. There might have been a faint hint of coconut. Perhaps the tea needed more steeping time? The third tea we ordered was the Flowering Tea and it was our favorite at the table! 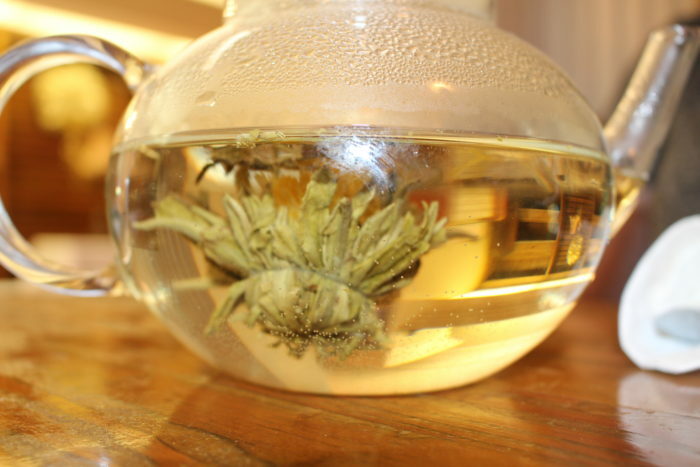 Flowering tea is typically a bunch of green tea leaves sewn together and then dried in the shape of a ball. When the ball of tea hits hot water it starts to unfurl and bloom into a graceful floating flower and we got to see the whole process in this glass teapot. Not only was it a visual treat, the tea had a refreshing and light taste with a pronounced apricot flavor. We thought it would also make a nice iced tea too. Here is the Tea Room Sampler. 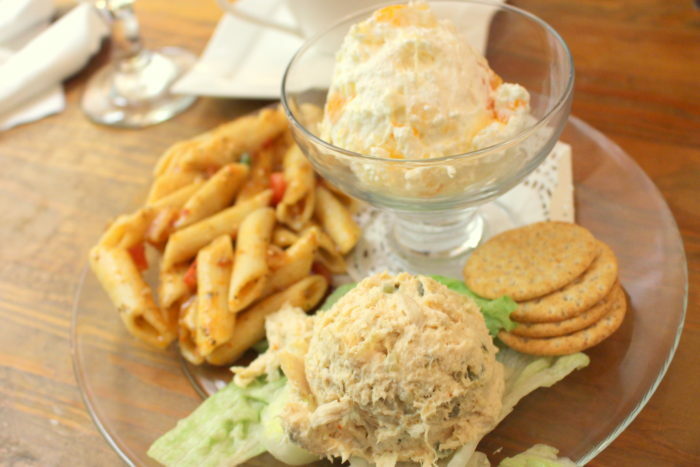 A scoop of chicken salad, an ambrosia salad and choice of another salad. The choice today was pasta salad. It was nice to try a variety of their offerings. The chicken salad was declared quite good. 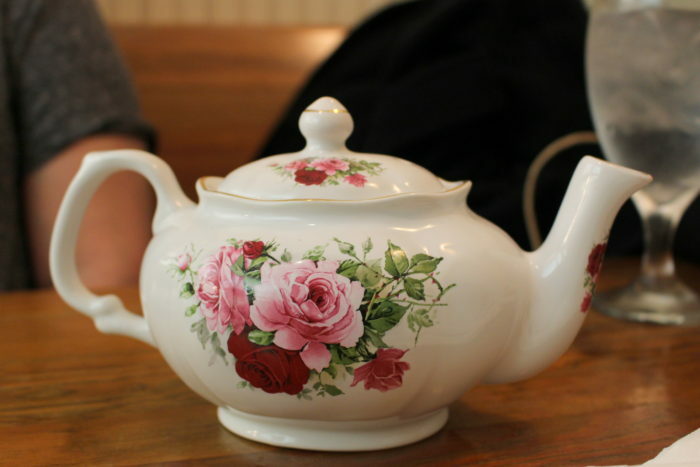 A must for a successful tea room. I ordered the crepes and I’d have to say skip this. The other items were better. 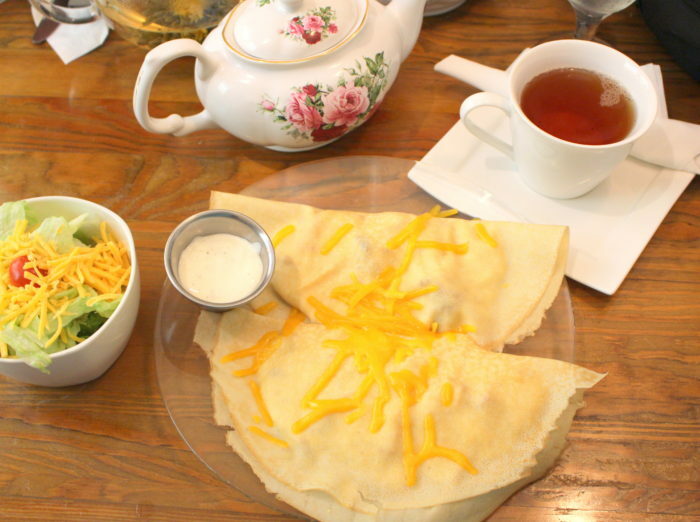 The crepes themselves were made perfectly – thin and chewy – but the creamy chicken filling could’ve used some more spices. It was too bland for me and reminded me of cream of chicken soup. It just needed something more. And the shredded cheddar cheese garnish didn’t go at all. I would’ve preferred some fresh herbs sprinkled on top. 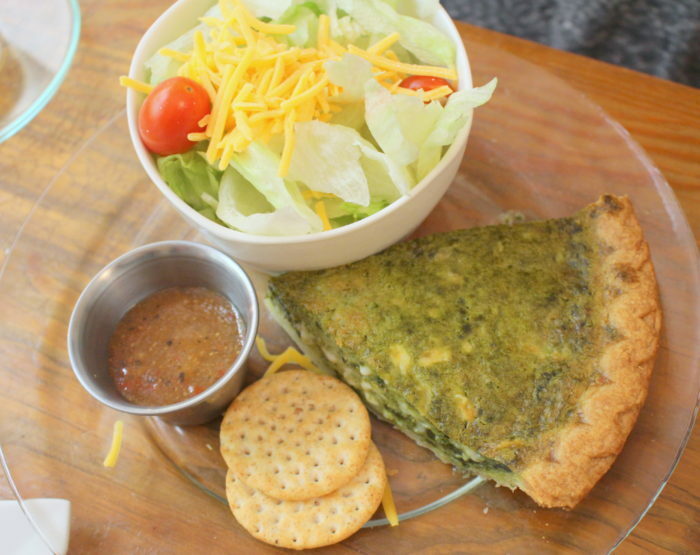 The spinach quiche was the best of all the items we tried. The filling was creamy and firm with a healthy serving of spinach in tender, flaky crust. I would definitely be happy to get this again. 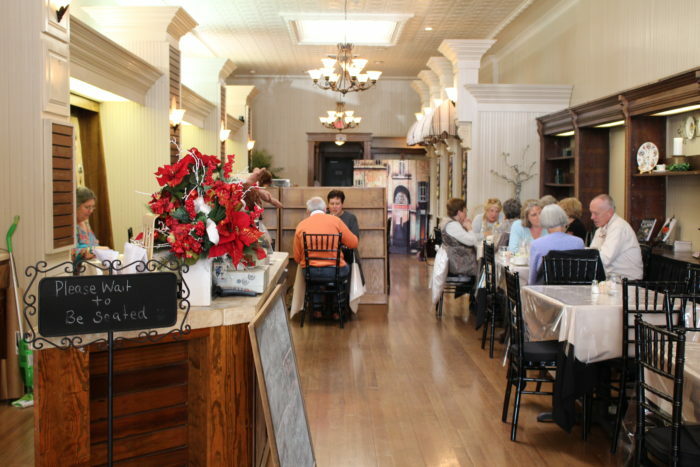 The restaurant is family owned by a Mom and two daughters and apparently they are known for their cakes. We were so full we skipped dessert but I’ll plan ahead for that next time. I also hear they offer afternoon tea so we’ll have to go back and see what that’s about. Sadly, they are not open on weekends. Just Monday through Friday so that makes it a little more challenging but if you’re able to find it and get there on a weekday, I know you’ll have an enjoyable lunch! 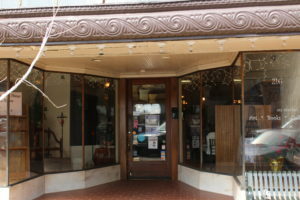 While you’re there don’t forget to walk around the corner to UG White – a cool, old Mercantile store. You’ll be glad you stopped in!